Getting fired is difficult for many reasons, and the stress of losing your job is often compounded by the fear that you will have difficulty securing another position. However, there are some measures you can take to minimize the consequences that a termination will have on your job search. Although getting a pink slip is bound to be a stressful time, if you break down your response into bite-size steps, you’ll find it doesn’t have to be as overwhelming as it first seems. Here are some tips on how to jump-start your job search following a firing. First, line up your allies, or those individuals who can give positive testimony about your productivity and value as an employee. If you have had positive work experiences with other organizations prior to your firing, ask past supervisors and other colleagues to prepare recommendations for you. Identify people at your most recent employer who are in a position to emphasize the key contributions that you’ve made despite your termination. Consider co-workers in your department, managers of interfacing departments, clients and other stakeholders when identifying potential references. Ask Your References to Provide Recommendations on Linkedin or in Written Form. By drawing employers’ attention to this type of positive information, you can counteract some of the negative perceptions of your dismissal. Share these online or written recommendations when networking or with your job applications when possible. Create or update your portfolio if you are in a field where work samples like reports, spreadsheets, PowerPoint slides, grant proposals, graphic designs, websites, or computer programs are showcased. Showing employers evidence of impressive work products can counterbalance some of the negative perceptions about your firing. Get the story straight about your performance in your last job and the circumstances surrounding your firing. Then, practice telling it to counselors, mentors, or other trusted confidants. Avoid disparaging your past employer or any of the staff. Identify specific achievements in your work and the skills that enabled you to generate those successes. Be ready to concisely relate the particular areas of your performance where you came up short. If possible, highlight areas not vital to your target job, or ones that you have taken steps to strengthen since being firing. Learn how to answer interview questions about being fired. Also, be aware of what employers can and can't say about a fired employee. You should take the opportunity to reflect on your career path when terminated from a job. Were the reasons for your firing unique to that employer and that supervisor, or indicative of a career that doesn't fit your strengths and personality? If the latter is true, then it may be easier to make a case for a job in a new field. For example, if you were fired from a sales job because you didn't land enough new clients, but despite this, you excelled in customer service, then you might now target inside sales or customer service positions instead. Keep in mind that a firing might also signal the time for a radical change in your career that could require additional education, training or grooming. If you take coursework, seminars, do an internship or freelance work in a new field, then this new experience may become more of a focus as employers evaluate your background than the last unsuccessful job. Remember that networking through friends, fellow parishioners, neighbors, professional colleagues, and college alumni will be more important than ever after a firing. These contacts will be more likely to listen to the nuances and explanations for your firing than employers at large. If they still believe that you can add value as an employee, then they might be willing to advocate for you at their employer or through their contacts. Review tips to help you best utilize your network. 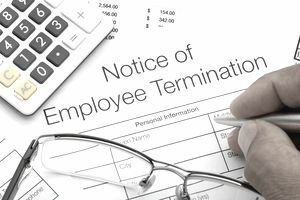 If a termination has not been finalized, consider the option of resigning and discuss that possibility with your employer. You may be able to extract a letter of recommendation in exchange for a quiet departure. It is also possible that you can postpone your resignation to buy some extra time to find a job while still employed. Make sure that you consult your unemployment office and assess the impact a resignation might have on your unemployment benefits.